From providing hot water for showers to powering washing machines, water heaters are one of the home’s hardest-working appliances. So when your water heater breaks down, finding a durable and affordable replacement can be tedious. 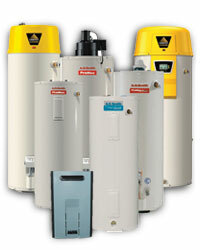 Pride Plumbing of Rochester in New York is your reliable source for installing a variety of water heater types. Conventional Storage Water Heater: This common model typically has an insulated storage tank that can hold between 30 and 80 gallons of heated water. It is powered by electricity, natural gas, oil, or liquid propane. Pride Plumbing of Rochester offers a wide range of water heater solutions, including the ProMax® line with gas rebate features. Tankless Water Heater: This appliance heats water on demand. This can save you money on your utility bills because the water heater only works when you're actually using the water. Ask the professional plumbers at Pride Plumbing of Rochester about the many energy cost savings that accompany this model. Electric Pump Water Heater: Heat is transferred to water in a storage tank by intensifying the heat that is drawn from the air. These water heaters tend to perform better in hot climates and can be more energy efficient than other types. In the market for a new water heater? Pride Plumbing of Rochester specializes in helping home and business owners choose the right model at the right price. Their expert team of plumbers also has the skills and specialty equipment to repair the water heater you already have. To schedule a service call or to get more details on water heater options, call Pride Plumbing of Rochester today at (585) 272-7272. Visit the website to learn about their other professional and affordable 24/7 emergency plumbing services.